April 23, 2016. 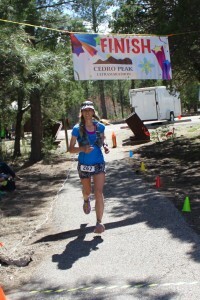 My third Cedro Peak 45-miler as a runner, but my first as a coach of sorts. In my real l, i.e. in between running or riding horses, I teach English and German at an international school in Northern New Mexico. 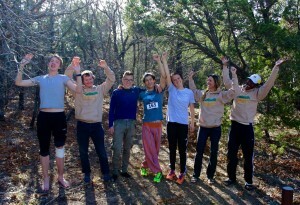 For the last couple of years, I’ve also been in charge of the student running club. Watching these young people from all over the world evolve into fitter, more confident versions of themselves through running is one of the most enjoyable parts of my job, especially when some of them become fit enough, and confident enough, to sign up for their first ultra. The United World College’s venture into trail racing began last November, when three of my students decided to join me at Franklin Mountain in El Paso for their first half marathon (http://runkat.com/wordpress/?p=456). Though that race ended with spilled blood (mine) and a bit of makeshift knee surgery, they were hooked after that. 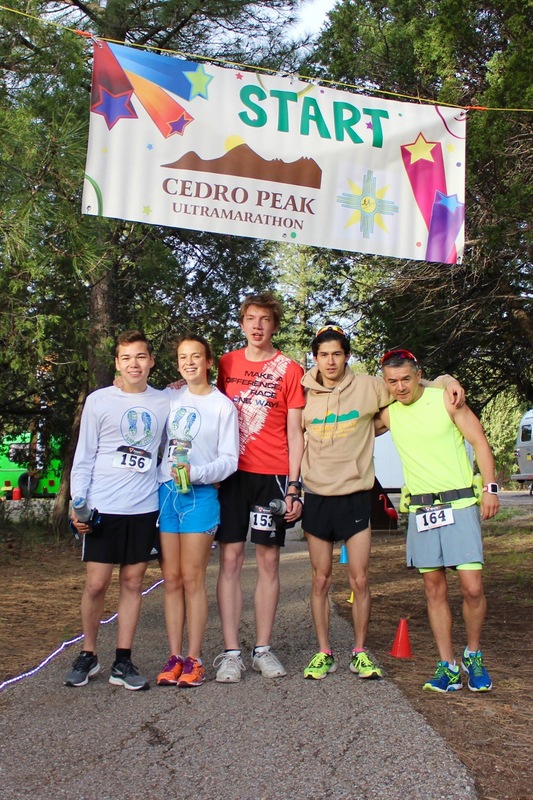 Undeterred by the potential dangers, they ran another half marathon at Antelope Canyon in February, which inspired a couple of other students to follow suit: four of them signed up for their first ultra, the 45k at Cedro Peak, while a fifth entered the half marathon. 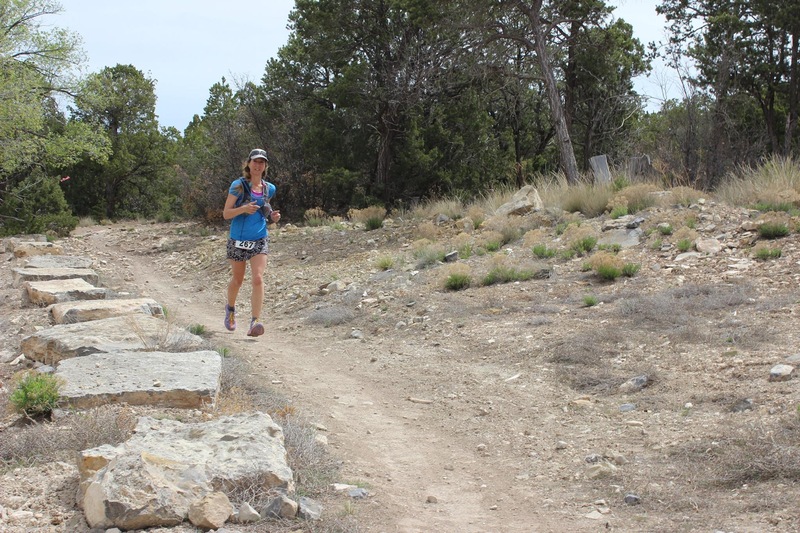 Race Director Kim King provided a generous scholarship in the form of a reduced student entry fee, which helped. Race weekend begins after school on Friday afternoon. We drive to Albuquerque, pick up our packets, and feast on pre-race carbs in the form of pizza. Ana, Ivik, Nico, Jani, and Daniel feel they are ready, though they have not trained as much as they should have. I tell them it’s all about mental readiness anyway, and they seem to believe me. 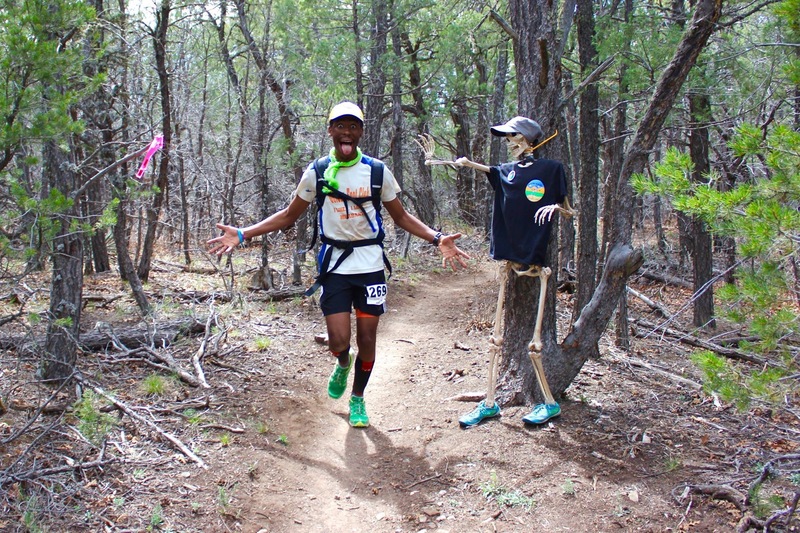 SP, my elite runner friend who sometimes joins our little group for runs that are hard for us but easy for him, is running the 45 mile race, with a real chance at winning. 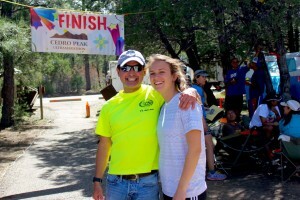 Nico’s father, an accomplished marathoner and triathlete, is joining us to run his first 45k. Most of the other parents are not quite as supportive; some of them think that their kids have gone insane, that racing a distance longer than a marathon is not something a normal person would do. The kids look pretty sane to me, and pretty normal, but I’m probably the wrong person to ask. Back at our hotel, I feel like Santa Claus, distributing Nuun tablets, Stinger waffles, energy chews, blister bandages, anti-friction powder and what I hope is good last-minute advice about hydration, nutrition and the like. Then, it’s time to sleep for a few hours before the 4:30 a.m. alarm goes off. The starting line in the beautiful Manzano Mountains East of Albuquerque is full of familiar faces, smiles, and greetings as the morning light turns grey silhouettes into shades of intense neon colors. 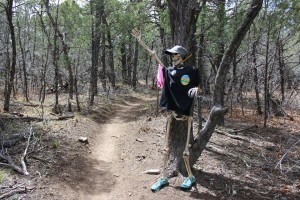 My husband, who has opted to volunteer at this race, takes pictures of our motley group, then, at 6:30, the 45-mile runners take off down the singletrack. I find a place in the middle of the pack, hoping that my students, who have gone back to sleep on the bus, won’t miss their 45k start an hour later. I catch a glimpse of another female runner ahead of me by mile five. 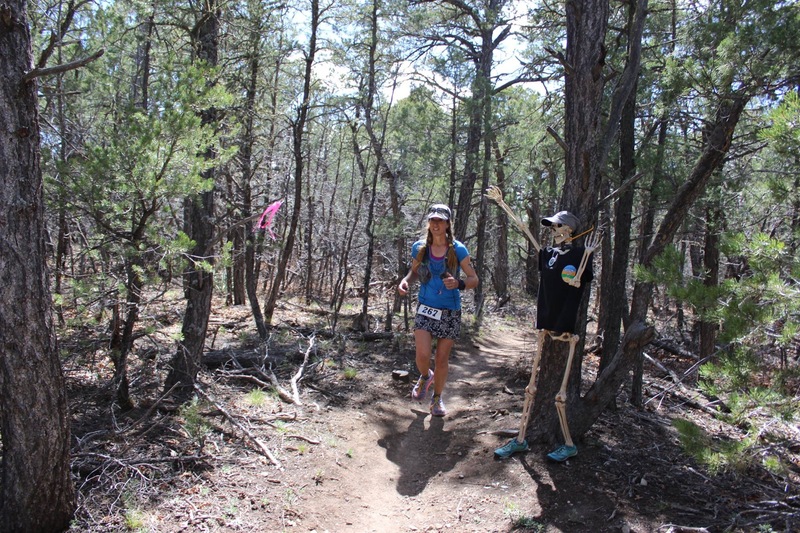 Bobby Keogh at the Juan Tomás aid station tells me it’s Stephanie, and that we’re in first and second place, respectively. My competitive instinct rears its little head and pricks up its pointy ears. Really? The race is on! By mile seven or so, I pass Stephanie, who looks like a very fit young whippersnapper, compared to my middle-aged self. I gloat just a tiny bit, but also worry whether I can maintain the breakneck speed of the last few miles. The trail is gorgeous, double track undulating its way through the pines. Morning sunlight filters through the branches. Birds are singing. I run fast and I run happy, until I realize I have not seen any pink ribbons in quite a while. Or any other runners. Huh? This is a well marked course. 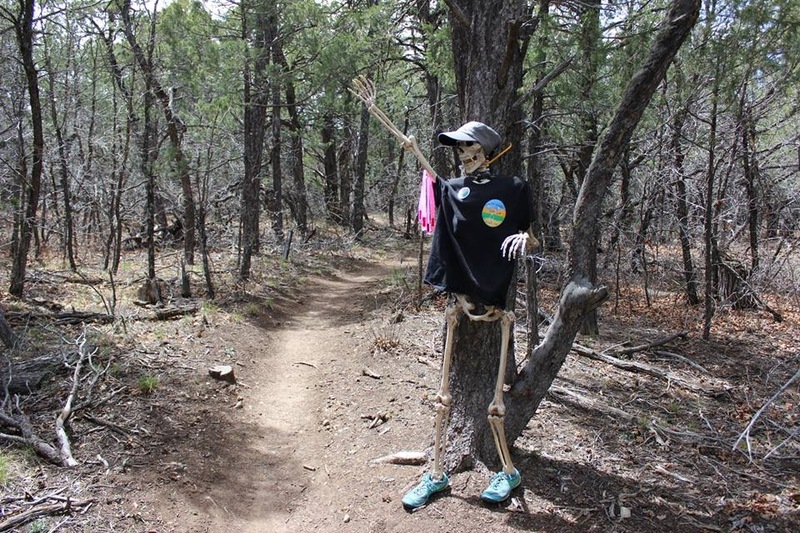 Can I be off trail? I continue a few more minutes. Still nothing. No ribbons, no other runners. The forest envelopes me in a silence I now find eerie instead of comforting. Time to backtrack. After what seems like an eternity, a pink ribbon, pointing down a narrow singletrack. I am mentally slapping myself. The classic rookie mistake, exactly what I warned my students about: wide tracks or roads look so inviting that it’s easy to miss a turn onto a narrower path. Yes, indeed. I should know better, since I am not a rookie, but a veteran. A cloud of dark thoughts gathers over my head as I consider the consequences of my stupid mistake: I was only a couple of minutes ahead of Stephanie before adding bonus mileage. Now, I have lost my lead, and about 15 minutes in addition. I plod on, much slower than before, dark thoughts swirling around me. 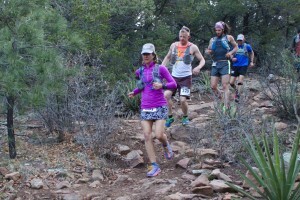 The climb up Cedro Peak is an out and back, and I see Stephanie flying down as I crawl up, still a long way from the top. But once up there, the view of the Manzanos and the sight of Eddie Dimas dressed like a robed ultra guru at the turnaround, cheers me up again. It’s a beautiful day, and I am here in the mountains, doing what I enjoy most in the world, surrounded by jaw-dropping scenery and the nicest human beings I have ever met. 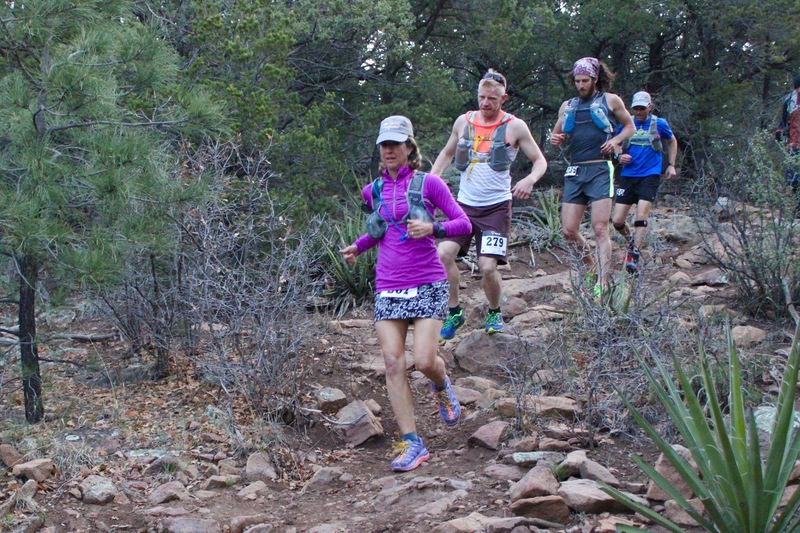 No, running ultras is not about winning or losing. It’s about so much more — it’s about connecting with nature, about feeling alive, about feeding my hungry soul. The cloud lifts, the darkness dissolves into grateful bliss. I pick up speed, resolving to enjoy the experience, no matter what the final outcome may be. Happiness has returned, but getting lost has zapped my route-finding confidence. 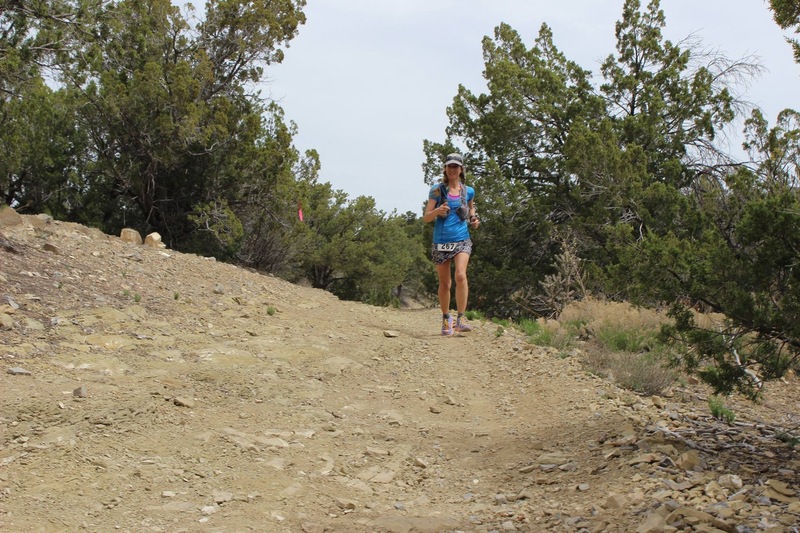 I stop a couple of times to look for ribbons, backtrack to the last ribbon, consult with other runners who are wondering which way to go. But at least I pay attention now. The familiar, friendly faces of Ken and Margaret Gordon greet me (in German!) at the Powerline aid station. They say I am only five minutes behind Stephanie now, which gives me another boost of energy. I zoom on, passing a couple of fast-looking runners. My husband meets me at the next aid station, with his camera and emotional support, which helps me negotiate the grueling powerline climb. I am having a good day, but Stephanie has an even better one: by the time I get back to Cedro, her lead has widened to eight minutes again. And by the time I get back to Juan Tomás, she’s once more ten to fifteen minutes ahead of me. Like Scotty on the Starship Enterprise, I am giving this course all I have, but it’s not enough today. I begin to pass the back of the pack of the 50k, some of whom are struggling. As I offer encouragement, I begin to wonder about how my students fared. My hope is they are long done. The finish line is getting close enough to smell it. The last climb, the Tequila aid station. 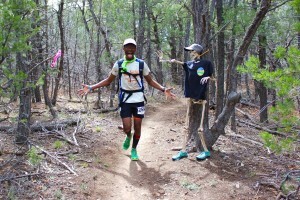 My husband, waiting by the plastic skeleton half a mile from the finish. I sprint into the campground and across the line in 8:52, good for second place and only five minutes slower than my course record from two years earlier, but fifteen minutes behind Stephanie, who shattered that course record by ten minutes. I suspect she would have beaten me even I had not gone off course, but we’re 5th and 6th overall. My middle-aged self is happy with that. I’m even happier that my students all have finished. They are tired, sore, hungry, and basking in post-race bliss. Jani’s knee is bandaged from a fall on one of the more technical sections. 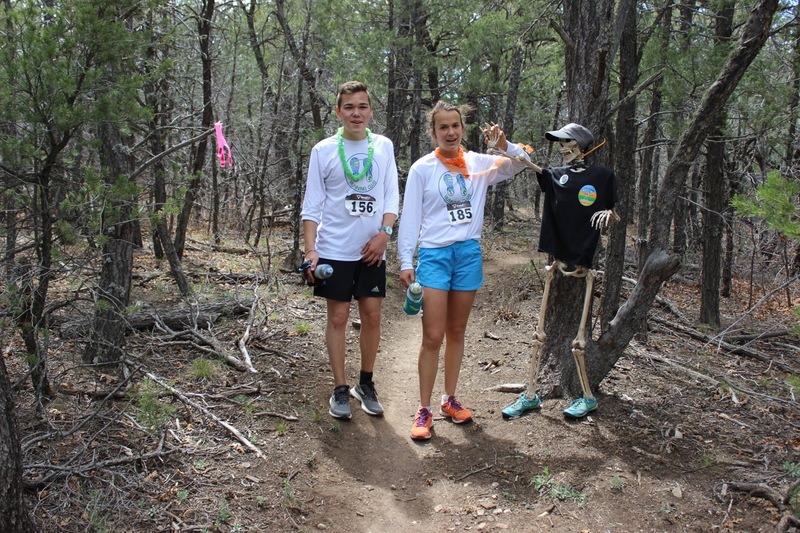 Daniel has won his age group in the half marathon, while Ana, Ivik, Nico, and Jani became ultra marathoners today — at age 18, they have accomplished something most people postpone indefinitely. Even more impressive is that all of them finished strong. Nico and his father finished together in 5:23, winning their respective age groups. And Ana won her age group. 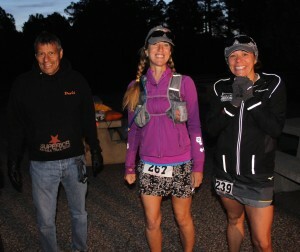 SP came in third overall in the 45 miler, in under eight hours. I am so proud of them all. A successful day is ending. Thank you, Kim King, for putting on such an organized, festive, welcoming event. Thank you, Ken, Margaret, David Infante, Eddie, Josh, Alex, Jean, Aimee, Bobby, and everyone else who helped make it happen. Thank you, SP, for inspiring the normal humans. 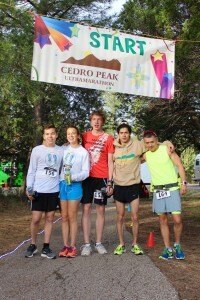 Thank you, Ana, Ivik, Jani, Nico, and Daniel, for sharing the experience of your first ultra and/or trail race. And as always, thank you, David Silva, for volunteering, for taking over 1000 pictures, for supporting, for driving, for cheerleading. It is a good time to be alive and running. This entry was posted in Uncategorized on May 1, 2016 by silvakat. Awesome report, awesome runner, awesome coach. Great run!!! Thanks, Tammy! How is your training? Nice job. Students do a an extra dimension. Glad you had a good race, though your pointy eared competitive self was not satisfied. Thanks, Mary Ann. To bad I didn’t get to see you. Feeling humble is good for my pointy-eared alter ego. You make me sound much younger and stronger than I really am! I was convinced you were right behind me and could blow by me at any time. What a wonderful race recap and it’s awesome you’ve inspired youth to follow in your foot steps. I coach high school girls soccer and they think I’m crazy for running ultras – they’d never join me! I know what you mean. I did that at Monument Valley – the thought of Laura breathing down my neck was great motivation. But you had so much speed left at the end, when everyone else faded. I caught and passed several pretty fast-looking guys, in the last 15 miles, but not you. Congratulations, speed demon!